Visual OMP’s simulation engine is a very powerful tool which uses multi-state coupled equilibrium to analyze the behavior of existing assays that did not perform as predicted in design due to poor thermodynamic design or the existence of prohibitive secondary structures. Once the offending primers or probes are identified, then Visual OMPs design engine can design new oligos in the presence of the existing oligos to optimize assay sensitivity and selectivity. 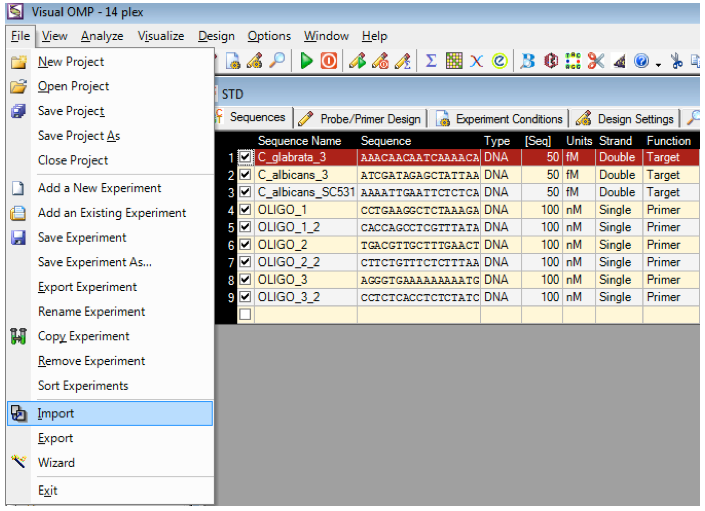 Existing sequences can be imported into Visual OMP from a fasta file and if the file contains no nomenclature, then the sequences will be imported as Oligo_1 and so on.